House Speaker Nancy Pelosi, second from right, speaks to media outside the West Wing of the White House in Washington, Wednesday. 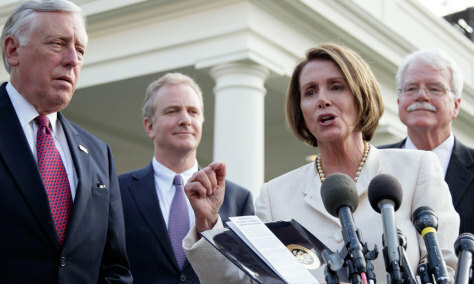 Standing with Pelosi from left are House Majority Leader Steny Hoyer, D-Md., Rep. Chris Van Hollen, Jr., D-Md. and Rep. George Miller, D-Calif.